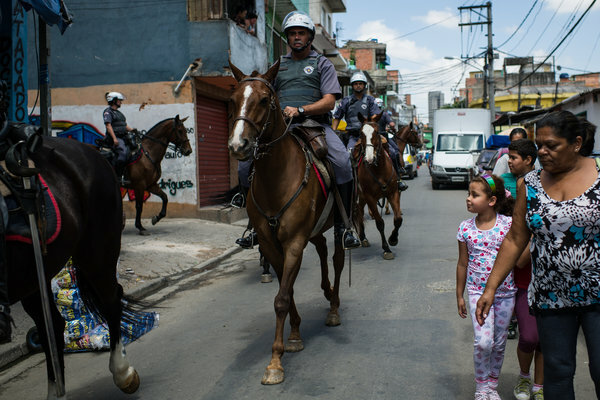 Brazilian mounted military police officers patrolled the streets in a shantytown in São Paulo, Brazil, last month. On the evening of Saturday, Nov. 3, Marta Umbelina da Silva, a military police officer here and a single mother of three, was shot in front of her 11-year-old daughter outside their house in Brasilândia, a poor community on the north side of the city. Records show that Ms. da Silva, 44, had never arrested anyone in her 15-year career. Instead, she was one of hundreds of low-level staffers, who mostly handled internal paperwork. São Paulo, Latin America’s largest city, continues to descend into a violent blood feud between the police and an organized crime group, the First Command of the Capital, known by its Portuguese initials P.C.C. In 2012, 94 police officers have been killed in the city — twice as many as in all of 2011. Between July and September, on-duty police officers killed 119 people in the metropolitan area. In the first three days of November, 31 people were murdered in the city. These statistics conceal a deeper story about Latin American cities, their police forces and the war on drugs. Ms. da Silva’s only mistake was that she lived in a poor community. And as a police officer, she was not alone. Almost all killings of São Paulo police officers in 2012 happened while they were off duty. The killings have been concentrated in poorer parts of the city, often occurring on officers’ doorsteps. The dead tended to be known in their communities and lived in neighborhoods controlled by organized crime, far from the protection afforded in wealthy parts of the city.